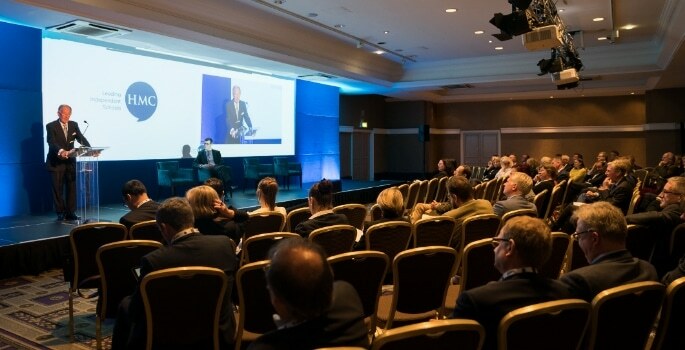 The HMC (Headmasters’ & Headmistresses’ Conference) Autumn Conference 2018 had the strapline ‘Together to Learn’, and as a first-time attendee, it certainly didn’t disappoint. Headteachers and others within the education sector are notoriously busy individuals, therefore, it says something that so many of them took a day out to come and be inspired. Shaun Fenton, HMC Chair and Headmaster of Reigate Grammar School, wrote a letter to fellow Heads prior to the conference, also delivering a shorter version on day one, that claimed that post-Brexit Britain needs its top independent schools more than ever. He cited his top ten ingredients for a great education: joy, creativity, good mental health, knowledge, physical health and happiness, focus and aspiration, creativity, moral and ethical purpose, flexibility and emotional literacy. He also highlighted how the leading independent schools represented by HMC have become a major global success story. While HMC Heads lead 12% of UK independent schools, they account for over half of the schools which have opened international campuses in the last ten years. With this in mind, here are my personal top five takeaways from HMC for you to ponder. Independent schools are saving taxpayers a staggering £3.5 billion every year by providing places for pupils who could otherwise attend state schools. This is according to a report by Oxford Economics, commissioned by The Independent Schools Council, called ‘The Impact of Independent Schools on the UK Economy’. This saving is enough to build more than 20,000 affordable homes. Barnaby Lenon, Chair of ISC, said the report was created because it is ‘rarely recognised that these schools contribute as much as they do’. They’re also major employers, with independent schools in 2017 supporting 303,000 jobs. The report also states that had all independent schools not existed in the 1940s, then UK GDP would have been £73 billion lower in 2017. They hope the report will change the minds of those who are critical of independent schools. After positive feedback from focus groups, many of which said they weren’t aware of these statistics, I imagine it can only help. Dave Cole, Managing Director of Shine Education and Training, and his colleague Bob Twells (both ex Heads) led a first-time workshop with HMC attendees, drawing on their wealth of experience in education. They discussed the characteristics of millennial teachers – such as being good team builders, highly-educated and tech-savvy, while also expecting opportunity for growth and work life balance. The workshop encouraged teachers to produce a bespoke action plan to better meet these needs. While teaching does provide many excellent opportunities, is there more we can do to retain younger members of staff? Back to Wimbledon High School again, but this time on developing critical digital skills. Head Jane Lunnon says a programme entitled Future Proof has been rolled out at Wimbledon High that teaches skills such as how to use Google properly and how to spot fake news. Technology was a massive talking point this year, with HMC and Digital Awareness UK (DAUK) launching a Tech Control 2018 campaign to help young people make good decisions about their use of technology. For more on this, make sure to read our upcoming November issue, where Emma Robertson, co-founder of DAUK, has written an exclusive piece for us on teaching children to use social media safely. Many who work in the education sector have done so for many years, so you’d be forgiven for thinking there aren’t any new ideas left. How wrong that would be. BeesMAX has found a new way to teach STEM subjects and learn about wildlife, by offering schools a software tool for remote access to beehives. Pupils can receive half hourly information on their hive, returned as a graphical display with sample lesson plans. The company’s Mark Gale told me what’s great about the idea is that it gives access of beehives to a much wider audience. It’s causing a real buzz (sorry) in schools in Yorkshire already, with many more schools interested.